Are you all confused? Hahaha! “Boldog születésnapot kis testvér” means “Happy birthday little brother” in Hungarian! It is my little brother Zanto’s first birthday today! Since we are battling to teach him to understand English I decided to learn Hungarian! HuMom says I am her best boy for being so considerate. Oooooh! There are going to be more babies at Tanyati in a few weeks! Both Raven and Bella have been telling everyone how they went on dates and that soon they will have babies. It is SO exciting here when puppies arrive. HuMom tells us all about them and shows us pictures of them when they are too small for us to touch noses with. But my favourite time is when we are allowed to see them for real. I love puppies. They give me ‘happy feet’, which is when I jump straight up in the air and backwards all in one go! HuMom says I am very athletic. Tee hee. So, that’s the little bit of news at Tanyati for now. Oh! Except for my tiger striped sister Maya. She had to have an operation on her front leg because something made it sick. She is very happy now because her leg looks pretty again. This is Morgan who-is-very-excited-to-learn-to-speak-foreign-languages-and-can’t-wait-for-new-babies-to-arrive signing off till next time! I must apologise for don’t writing for so long! My Mommy has been so very slack about leaving her computer on for me to write. I am so glad to hear you are getting better and am very sorry about your Mommy – we said prayers. So I hate my bandages – I pull them off and Mommy has to put new ones all the time, ya, about 4 a day. Then back to the vet every second day – it’s so horrible. Then today we went back and I had to have another operation because me and Dex were especially wild yesterday and all my stitches came out. The vet lady was most disappointed at Mommy for not keeping me calm – Mommy was not happy at all about that. But I’m going to try very hard to be a good girl – I definitely don’t want to have another operation. The one cool thing is that Mom’s been letting us sleep on the bed with her – and we love to cuddle. Dad doesn’t love it so much, he gets very cross, but we all put our sad facies on (and Mom too) and then he shakes his head. On the weekend Dad came home late and he was not happy when he came to bed because it was me and Dex and Mommy and Cu and Morgan and Amber and Mashi and Zalo – all on the bed. He said he was going to sleep somewhere else. Then he told Mommy in the morning that the only ones missing from the bed were Gemma and the snake and that it’s ridiculous. Mommy called him a meanie. Mommy has been reading this book and I am not sure if I like that book – when she reads it she cries all the way through – but then I do like that book because when she stops reading it she TALKS to us – LIKE IN DOGGY LANGUAGE!!! How cool is that?! She told me and Dex it’s a book about talking to animals. She’s not brilliant at it yet but she is getting better. Cu can do it too – he’s really good at it – he should teach Mommy. Amber, the cat who is the boss of our house, says that sometimes she and Mommy talk and that Mommy can talk cat – just needs to learn dog. I help her though so when she tells me to sit and stuff I do it so nicely and Daddy can’t believe his eyes! And it’s nice you know, before just all that noise coming out of her mouth and how must we know what she means? So I think I actually love the book – even though it makes Mommy cry. I’m going to go have a sleep on the bed now – Mommy’s going out tonight and I just know Dad’s not going to let me sleep there when she’s gone. I will write again soon – I didn’t even tell you all my news but I’m so tired from all the stitches and bandages. Today is a very sad day at Tanyati. My real mom, Danni, died. We have all been crying today and none of us wanted to play any games. HuMom has also been crying and I have tried to be a very good boy and I cuddled her and licked her gently, just like my mom used to do. 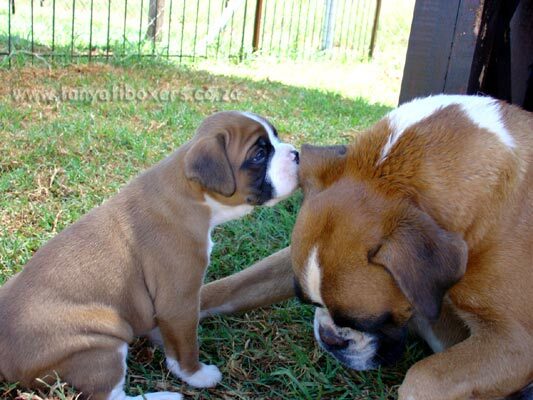 She says I am a special boy who had a special mom and that I am one of the luckiest Boxers in the world. 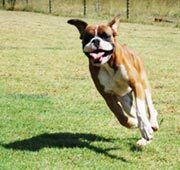 I know that my mom is now playing fetch with Lord Inca and my granddad Merlin and all the other Tanyati Boxers that went to heaven before us so that they could make it all nice for us when it’s our turn. Please say a prayer to the Doggy God to look after my dear, sweet, happy, special Mom. This is Morgan-who-misses-his-mom-very-much-and-hopes-that-she-likes-playing-with-all-the-angels signing off till next time. Are baby tigers called tiglets? So my tiger-striped sister Maya has had 8 babies. And now we are all wondering what you call baby tigers! Shakira thinks they are called tiglets. You know, like baby pigs are called piglets… Bella says she thinks they are called Mayalings. You know, like baby geese are called goslings… My new brother Zanto, who only speaks Hungarian, says that they are called kölyök… No comment. So, I begged HuMom to let me show you what the tiglets/mayalings/kölyök look like and she said I could put this photo on for you all! They’re cute, hey?! As soon as HuMom takes more photos I promise that I will show them to you! This is Morgan who-thinks-that-his-sister-is-ever-so-amazing-to-have-8-baby-whatsits signing off till next time! Guess what? This morning HuMom told me I could not eat breakfast as I needed to go and see Dr Tim so he could put a camera down my throat and look for that horrible worm. I was a very good boy. I lay in my crate and watched while everyone ate and even though I was very hungry I knew HuMom would give me LOADS of kisses because she hates to let us be hungry. And I was right! Boy did I get kisses and hugs and HuMom held me tight and told me how much she loved me. I love HuMom. Then off we went to Dr Tim and I felt very sleepy and then next thing I knew HuMom was kissing and hugging me AGAIN! Boy oh boy! And then I heard Dr Tim tell HuMom that I was completely cured and that there was no sign of that horrible spiral-circus worm, or whatever it is called! I think it got so scared of the injections HuMom was giving me that it went to find another circus! Good riddance! HuMom says we will celebrate with something special for supper tonight! I can’t wait. We think you’re good as gold! Think you’ve got good pipes! You sure would beat the rest! This is Morgan-who-is-not-scared-of-circus-worms-and-has-an-old-mom signing off till next time!